Concrete mixing station equipment is used to concentrate on mixing concrete joint device, also known as concrete prefabricated field. 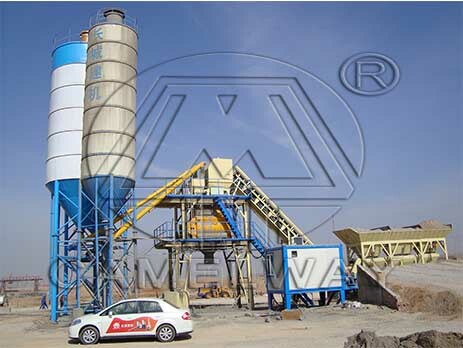 What are specific concrete mixing equipment, according to the requirements of the production line. Different requirements use different concrete mixing equipment, but the main equipment is the same. Equipment is mainly composed of mixing console, materials weighing system, material conveying system, material storage system, control system and other ancillary facilities. Because of its mechanization, high automatic degree, so the productivity is high, and can guarantee the quality of concrete and saving cement. Mixing console is divided into forced concrete mixer and gravity type concrete mixer. Materials weighing system is the key to affect the quality of concrete and concrete production cost components, mainly divided into aggregate weighing, powder and liquid weighing three parts. Basically the same concrete material storage available way. Aggregate open-air stacking;Powder with fully enclosed steel silo storage; Container storage admixture with steel structure. Control system is the central nervous system in the complete equipment.